I'm using PF 8.0 (build 1859) on a Mac Pro, Early 2009, 2.66 GHz Quad-Core Intel Xeon, 20 GB of 1066 MHz DDR3, OS X 10.11.6 (I know, it's old, but it works great!). There doesn't seem to be a choice of "no tag" in the contextual menu (see screenshot). Why? We need this. It's a hassle to have to click on "Tags and Rating..." and then manually delete a color if it is there. I thought this same thing. Thanks! Works perfectly. I figured I was doing something stupid, but I'm used to that! There is a bug with the tags. Removing doesn't work for the green tag for me. Every other I can remove by clicking it again, but the green tag stays and doesn't shows up with the active marker in the right click menu, yet the file stays tagged. The only way to remove a green tag is to go with the information menu, open tags and ratings and remove the green tag manually there. This seems to be a bug related to the German localization which is pretty annoying. The green tag uses a German Umlaut and is named "Grün" in German (the only color tag with an Umlaut), which seems to confuse PF8. 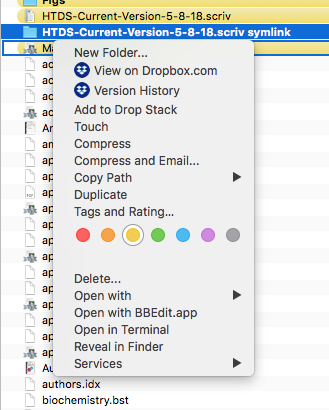 The tag can't be removed and assigning the tag has other side effects as well, as an unmount icon in the left hand "Devices" menu becomes activated (changes to the mouse hover icon) when assigning the green tag to a file. Path Finder Support Team closed this discussion on 26 May, 2018 03:29 PM. In PF7 the "X" (remove color tags) was fine to remove all colored tags. That helped me to remove i.e. my red "Unfinished" tag. I miss that one-click-feature in PF8. Here I have to go to the tags listing and remove specific (colored) tags manually. Path Finder Support Team closed this discussion on 30 May, 2018 07:22 PM. Just as an update, even in version 8.0.4 the green ("Grün") tag is still bugged for the German language. PF8 doesn't like umlauts in tags. Is there any workaround for this? Is it possible to rename the tag? Path Finder Support Team closed this discussion on 07 Jul, 2018 02:07 PM. The green ("grün") tag is still bugged in version 8.3.9. - honest question, will the German language version ever get fixed or at least an option implemented to switch the language to english, or should I give up on it when I need tags fairly extensively? Unfortunately, I can't confirm the exact timeline for you. Apps detect your system-wide language in Preferences, that's how it works on Mac. Path Finder Support Team closed this discussion on 08 Feb, 2019 10:01 AM. Thanks for the reply. Actually, it would already be enough if you just change the tag color name „grün“ in the German localisation to „gruen“. The Umlaut „ü" can be written as „ue“ in German, and without the Umlaut the tags should work just fine as in other languages. > Unfortunately, I can't confirm the exact timeline for you. > Apps detect your system-wide language in Preferences, that's how it works on Mac. > Sorry for the inconvenience. Please feel free to write us back and we will be happy to assist you. Thank you, I'm not sure if this is going to be the fix but I will submit it to our developers. Path Finder Support Team closed this discussion on 08 Feb, 2019 12:13 PM.